As Australia’s largest boarding school for boys, St Joseph’s College’s Health Centre is tasked with caring for the day-to-day health of almost 600 boarders. During school hours the centre also provides health care as needed for the almost 500 day boys enrolled at the College. 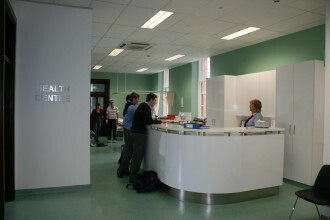 The College Health Centre provides a professional, on-site health service to the students at St Joseph’s. During term time the Health Centre is open 24-hours a day, seven days a week and is always staffed by a registered nurse. The College doctors, Dr Andrew Bowes and Dr Anthony Keane are available for consultation with boarding students each week-day morning at 8am. Outside the doctors’ normal hours, students in need of a doctor are referred to Hunters Hill Medical Centre or the local hospital. In addition to looking after boys when they are sick or injured the Health Centre is also responsible for handing out medication, vaccinations, pre-sport strapping, referrals and monitoring boys with special conditions (diabetes, epilepsy etc.). SJC Health Centre was extensively renovated during 2013. The work involved a complete gut and remodel of the centre and resulted in a space that is spacious, practical and full of light. 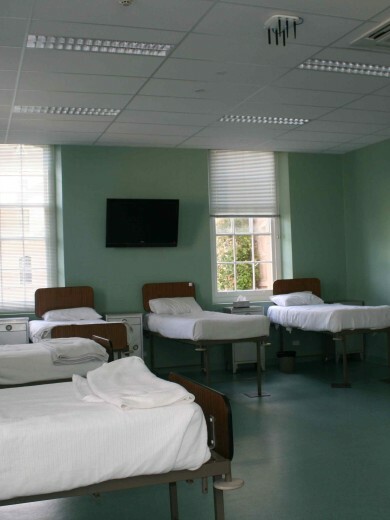 The Health Centre is fully air-conditioned and includes a 12-bed sick room and new bathrooms. There are also two single rooms with a connecting disabled bathroom. The Health Centre undertakes continual self-review of its procedures and practices. During self-review the policies of the Department of Health and the Department of Education and Training are used as guidelines. Equipment is reviewed as required by guidelines – from daily to annually. Parents of students with special health and dietary needs are encouraged to contact the Health Centre staff to discuss any concerns. All students who are ill at the College must present to the Health Centre. If they leave class to do so, they must have written permission from their teacher. If a day student is sick, parents should keep him at home and notify the Health Centre. If a day student becomes ill or is injured at school he will attend the Health Centre. If he is unable to return to class, his parents will be notified and asked to collect him. If a boarding student is unwell or injured he will report to the Health Centre and be assessed, treated and, if necessary, referred on by the nursing sister. If a boarding student is to unable to return to school he will be put into a bed in the Health Centre and parents will be notified as soon as practicable. If any student needs to be transferred to hospital parents will be notified as soon as possible. If a day student is to be absent from school for all or part of a day parents must enter this into the Boardingware leave portal as early as possible. This information will then be directed to appropriate staff. If an appointment has been made outside the College for a student, that appointment should be communicated to the College through the Boardingware leave portal as early as possible and at the latest, 8:00pm the evening before the appointment. Boys may be collected by parents, travel by public transport (by himself) or via taxi. This should be noted on the leave request. A Gap Assistant (graduate student on exchange from the UK) may be available to travel with younger students; however, Gap Assistants only travel by taxi and may have other duties at that time. The cost of the taxi will be debited to the parents’ account. Students going to appointments outside the College must travel in their full College blues, with the exception of a student visiting a physiotherapist. No student is permitted to have any medication (prescription or over the counter) on his person without his parents speaking to the Health Centre nursing staff. Students are permitted to keep asthma and some other medication after it is cleared with the Health Centre. No student will be given permission to keep Schedule 4 or 8 drugs (e.g. Ritalin, anti-depressants) under any circumstances. These drugs must remain in a locked cupboard in the Health Centre. Prescriptions are filled on weekdays by the College’s local pharmacy. The cost of prescription medications is debited to parents’ credit card at the end of the month (credit card details are held by the Finance Office). Medical records are maintained for each student during his years at the College. Parents must update this information each year. This is extremely important to ensure the proper care is provided for all students. All medical records remain confidential and only information which is considered necessary for the wellbeing and safety of students will be given to the relevant staff. Parents should ensure their son is up to date with his vaccinations and advise Health Centre staff of vaccinations so records are accurate. Most vaccinations are done by NSW Health through the College; however the Health Centre offers annual flu vaccinations to students. Students are asked to present to the Health Centre or appropriate first aid station with any injuries. The Health Centre staff can provide strapping when it is required by a student and the cost of strapping tape is debited to the parents’ credit card. Ice machines (for injuries) are available in certain areas of the College. Students may be referred for physiotherapy or x-rays and the providers of these services will bill parents directly. Mouthguards can also be purchased at the Health Centre.